Acute-on-chronic liver failure (ACLF) is a syndrome characterised by acute decompensation of chronic liver disease associated with organ failures and high short-term mortality. Alcohol and chronic viral hepatitis are the most common underlying liver diseases. Up to 40%–50% of the cases of ACLF have no identifiable trigger; in the remaining patients, sepsis, active alcoholism and relapse of chronic viral hepatitis are the most common reported precipitating factors. An excessive systemic inflammatory response seems to play a crucial role in the development of ACLF. Using a liver-adapted sequential organ assessment failure score, it is possible to triage and prognosticate the outcome of patients with ACLF. The course of ACLF is dynamic and changes over the course of hospital admission. Most of the patients will have a clear prognosis between day 3 and 7 of hospital admission and clinical decisions such as evaluation for liver transplant or discussion over goals of care could be tailored using clinical scores. Bioartificial liver support systems, granulocyte-colony stimulating factors or stem-cell transplant are in the horizon of medical care of this patient population; however, data are too premature to implement them as standard of care. Cirrhosis is a pathological diagnosis characterised by diffuse fibrosis, severe disruption of the intrahepatic arterial and venous flow, portal hypertension and, ultimately, liver failure.1 Traditionally, cirrhosis has been dichotomised in compensated and decompensated, and the transition to decompensated cirrhosis happens when any of the following hallmarks occurs: presence of ascites, variceal haemorrhage and/or hepatic encephalopathy (HE).2 Once cirrhosis transitions from the compensated to the decompensated stage, it is associated with short-term survival (3–5 years) and evaluation for liver transplant is recommended in the absence of contraindications. If cirrhosis is mediated by a treatable cause (eg, chronic viral hepatitis, ongoing alcohol consumption, obesity, etc), then patients may have transition from a decompensated to a compensated phase. 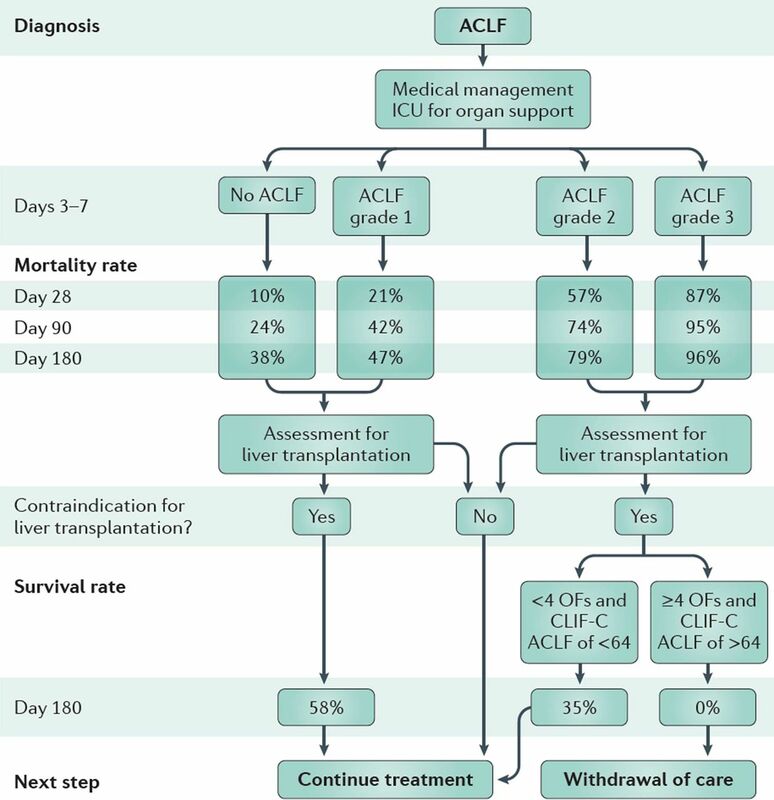 The concept of acute-on-chronic liver failure (ACLF) has been widely used in critical care hepatology to study patients who underwent artificial support therapies as a bridge to liver transplantation (LT).3 In 2009, the Asian Pacific Association for the Study of the Liver (APASL) provided the first consensus on ACLF, defined as “an acute hepatic insult manifesting as jaundice and coagulopathy, complicated within 4 weeks by ascites and/or encephalopathy”.4 The 2014 definition was further expanded to include ‘high 28-day mortality’.5 Such initiative led the scientific community to identify new venues of research of a syndrome with extrahepatic organ failure (OF) associated with short-term mortality. The current narrative review will provide insights on the current understanding of ACLF with emphasis on established definitions, epidemiology, pathophysiology and treatment/management options. ACLF is a syndrome characterised by acute and severe hepatic abnormalities resulting from different types of insults, in patients with underlying chronic liver disease or cirrhosis but, in contrast to decompensated cirrhosis, has a high short-term mortality, mimicking the prognosis of acute liver failure. Nevertheless, the key terms of the definition ‘acute’, ‘chronic liver’ and ‘failure’ have several variations and, a recent systematic review reported up to 13 definitions of ACLF.6 Given this heterogeneity and the importance of identifying patients with ACLF for a more expedited triage and work-up, four major societies/organisations have provided working definitions that, although not consistent, lay the groundwork for future research (table 1)5 ,7–9 and have been used clinically.10 ,11 Overall, the APASL provided the first consensus definition on ACLF in 2009,4 later updated in 2014.5 The main difference with all other definitions is that hepatic insults are only taken in consideration if they lead to liver failure (jaundice and HE). The North American Consortium for the Study of End-Stage Liver Disease (NACSELD) centred their efforts to understand the factors associated with mortality in hospitalised infected patients with cirrhosis.7 Consequently, all other triggers were not considered and the generalisability of their findings to non-infected patients with cirrhosis is unknown. The European Association for the Study of the Liver-chronic liver failure (EASL-CLIF) Consortium and called the EASL-CLIF Acute-on-Chronic Liver Failure in Cirrhosis (CANONIC) study is the most comprehensive registry to understand outcomes on hospitalized patients with cirrhosis.9 Similar to NACSELD, the inclusion criteria were patients with cirrhosis, but there were no restrictive inclusion criteria and operational definitions for OF in EASL-CLIF were clearly outlined (table 2). The prevalence of potential triggers also varies by the area of the world. For example, in the CANONIC study, bacterial infections and alcoholism are the two major identifiable factors, compared with China, where relapse of hepatitis B was predominant followed by bacterial infections9 ,14 (table 4). Despite exhaustive examination, in 20%–45% of cases, the trigger remains unknown. The type of injury also seems to influence ACLF outcomes as recently published by Shi et al.14 Four hundred and five Chinese patients who met CANONIC criteria were divided in hepatic-ACLF trigger, that is, driven by primarily liver toxins (alcohol, hepatitis) vs extrahepatic-ACLF (eg, infections). Both groups had high 28-day mortality (48.3% vs 50.7%), but this difference changed after 90 days (58.9% vs 68.3%) and 1-year mortality (63.9% vs 74.6%). In the CANONIC study, the kidneys were the most common affected organs (55.8% of patients), followed by the liver (43.6% of patients), coagulation (27.7% of patients), the brain (24.1% of patients), circulation (16.8% of patients) and the lungs (9.2% of patients).9 In the NACSELD study, 55.7% had grade III–IV HE, 17.6% developed shock, 15.1% required renal replacement therapy and 15.8% required mechanical ventilation.7 The proportions in the American study are lower compared with the European one, but are likely a reflection of a broader inclusion of patients with cirrhosis in the CANONIC study. Systemic inflammation is a hallmark of ACLF;9 ,24 white cell count and plasma levels of C reactive protein (CRP) and pro-inflammatory molecules such as interleukin (IL)-6, IL-1β, IL-8 are higher in patients with ACLF than in those without.25 ,26 Currently, there is no mouse model of ACLF, this is why results obtained in translational studies performed in patients are important to consider. Before commenting on inflammation in the context of ACLF, it is important to have in mind some general information on the inflammatory process. Inducers of inflammation are either exogenous or endogenous.27–29 Among exogenous inducers, only microbial inducers will be discussed because the others have been already reviewed28 and are beyond the scope of ACLF. Bacteria trigger inflammation by using two distinct classes of molecules: pathogen-associated molecular patterns (PAMPs)27 ,29–31 and virulence factors.27–29 PAMPs are unique molecular signatures that are recognised via dedicated receptors called pattern-recognition receptors (PRRs), a process called structural feature recognition (figure 1)32 (table 5). Inflammation caused by microbes. Top: Microbes (bacteria, viruses, fungi) induce inflammation via two classes of molecules: pathogen-associated molecular patterns (PAMPs) and virulence factors. Sensors of the innate immune system recognise the invading microbe via recognition of PAMPs, which are conserved molecular patterns (structural feature recognition). Sensors are known as pattern-recognition receptors. The second class of microbial inducers of inflammation includes a large number of virulence factors. Most of these factors are generally not recognised by dedicated receptors but can be sensed via the effects of their activity (functional feature recognition). For example, there are bacterial virulence factors which cause modifications and inactivation of host Rho GTPases and these alterations are sensed by the Pyrin inflammasome. Infection may be associated with tissue damage caused by the bacteria or by the immune response to bacteria. Tissue damage can induce inflammation which is committed to tissue repair (see text and reference32). Bottom: Proposed interventions. MELD, Model For End-Stage Liver Disease score. Viruses or fungi are recognised by different PRRs (table 5). For example, viral nucleic acids can be recognised by endosomal TLRs, cytosolic receptors (RLRs or DNA sensors). Fungi express PAMPs that are detected by C-type lectin receptors. 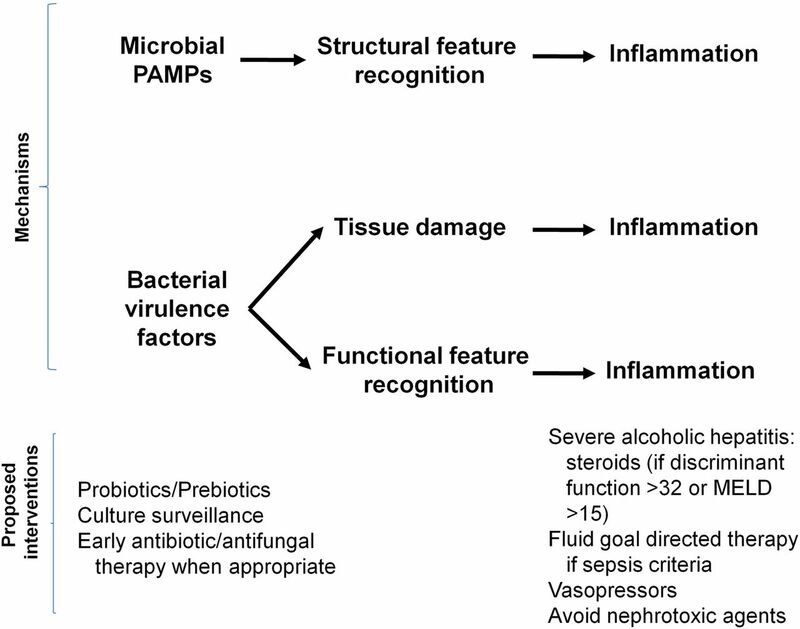 Like detection of bacterial PAMPs, that of viral or fungal PAMPs can trigger inflammation (figure 1). Endogenous inducers are released by necrotic cells or as a result of extracellular matrix breakdown.28 ,33 These endogenous inducers are called danger-associated molecular patterns (DAMPs)33 because they alert the host's immune system about the presence of a serious tissue injury. DAMPs are recognised by receptors of the host (table 6) and this recognition induces sterile inflammation. The excessive inflammatory response to PAMPs or DAMPs can be due to host genetic factors. In the general population, in the context of infections, single nucleotide polymorphisms (SNPs) related to genes encoding molecules involved in the immune response have been shown to be associated with the risk of severe inflammation. For example, significant polymorphisms have been found in CD14 (encoding a cell surface receptor that contributes with TLR4 and MD2 to recognition of lipopolysaccharide (LPS)), TNF (encoding tumour necrosis factor (TNF)-α), LTA (encoding lymphotoxin-α), TLRs (TLR1, TLR4, see table 5), TIRAP (encoding toll/IL-1 receptor domain-containing adapter protein, transducing TLR4 signalling), MIF (encoding macrophage migration inhibitory factor), SERPINB2 (encoding plasminogen activator inhibitor 2), ADRB2 (encoding β-2 adrenergic receptor) (reviewed in37 ,38). The severity of infection can also be related to pathogens (Gram-negative infections being more severe than Gram-positive infections) or to the site of infection (intra-abdominal sites having the highest risk of death and urinary the lowest).38 However, the role of excessive inflammation in the higher severity of infections, depending on the pathogen or site of infection, is unclear. Systemic inflammation and the development of OFs are attributed to bacterial infection in approximately 30% of patients with ACLF.9 These patients have sepsis-induced ACLF. The most common infection causing sepsis-induced ACLF is spontaneous bacterial peritonitis (SBP).9 SBP is a paradigm in that it is often caused by Gram-negative bacteria that have migrated from the intestinal lumen to ascitic fluid via the systemic circulation. During the acute phase bacterial infection, patients with cirrhosis have higher plasma levels of pro-inflammatory cytokines (TNF-α and IL-6) than patients without cirrhosis.39 Among patients with SBP, those who develop kidney failure have higher plasma TNF-α and IL-6 than those who do not develop this complication.40 Mortality related to bacterial sepsis is greater in patients with cirrhosis than in those without.30 Interestingly, cirrhotic rats challenged with LPS (a bacterial PAMP recognised by the PRR (TLR4)) exhibit excessive systemic inflammation, severe acute liver injury and early mortality relative to non-cirrhotic animals (reviewed in27). Together these results suggest the existence of an excessive inflammatory response to bacteria in cirrhosis. However, little is known about the underlying mechanisms that explain the excessive inflammation in cirrhosis. There are studies that focused on the ex vivo response to LPS in freshly isolated monocytes or peripheral blood mononuclear cells from patients with cirrhosis and without cirrhosis. These studies suggest an excessive innate immune response to LPS related to defective negative feedback mechanisms of the TLR4-mediated response. These defects involved the phosphoinositide 3­kinase/AKT/glycogen synthase kinase pathway as well as the induction of IL­1 receptor­ associated kinase M (reviewed in27). There are also studies showing that single nucleotide polymorphism (SNP) is some selected genes involved in the innate immune response were associated with increased risk of infection and mortality (reviewed in29). However, nothing is known about the mechanisms by which these SNPs might interfere with the immune response to bacteria. Moreover, the association of these SNPs with patients' outcome needs to be confirmed by using genome-wide association studies in a large series of patients with cirrhosis. Severe alcoholic hepatitis (SAH) represents approximately 25% of the cases of ACLF.9 Severity is related to the development of OFs.9 Systemic inflammation develops in patients with SAH and correlates with the outcome suggesting a role of inflammation in the development of OFs.41 Systemic inflammation can be caused by bacterial infection which is present in ∼30% of patients admitted to the hospital for SAH.42 Excessive alcohol consumption is associated with intestinal dysbiosis and increased intestinal permeability, which favour translocation of viable bacteria.27 This may explain why SBP is the most common infection at admission of patients with SAH.42 However, systemic inflammation is also observed in patients with SAH without clinically detectable bacterial infection.9 ,41 In this context, the mechanisms explaining systemic inflammation are unclear. Alterations in the gut microbiome and intestinal permeability may favour the translocation of bacterial PAMPs (eg, LPS) as suggested by the findings of increased systemic LPS levels in patients with SAH.41 Therefore, increased circulating levels of PAMPs may engage their cognate PRRs and stimulate inflammation in the liver and the systemic compartment. Moreover, in patients with SAH, higher the LPS levels, higher is the intensity of the systemic inflammatory response.41 Accordingly, in these patients, LPS-driven inflammation could play a major role in the development of OFs and subsequent death.41 On the other hand, systemic inflammation may originate in the diseased livers from patients with SAH. Indeed, several pro-inflammatory molecules are overexpressed in livers with SAH relative to livers without SAH,43 suggesting that these molecules may spill-over the liver and reach systemic circulation. Future studies should address the PAMP-induced and liver-related theories for systemic inflammation in SAH. About 40%–50% of patients with ACLF have systemic inflammation for which there are no clinically identifiable triggers.9 Three hypotheses may explain the induction of inflammation in this context (reviewed in27). In sum, the first hypothesis suggests that metabolites produced by gut bacteria may reach the systemic compartment and stimulate inflammation. This hypothesis is based on the following clues: (1) gut dysbiosis has been shown in patients with cirrhosis and (2) gut bacteria produce metabolites that may interact with the inflammatory response of the non-cirrhotic host. The second hypothesis for ‘unexplained’ inflammation in ACLF involves translocation of bacterial PAMPs and the third one suggests an action of DAMPs. High-throughput techniques investigating metabolome, lipidome, glycome and metagenome would be useful to address these hypotheses. Although excessive systemic inflammation is believed to be the driver for the development of OFs, one cannot exclude that other mechanisms may contribute to this development. For example, there are studies under non-cirrhotic conditions, showing that severe outcome of bacterial infection can be caused by failure of mechanisms that are intrinsic to tissues and protect them against the noxious effects caused by the microbe itself or the host's immune response.44–46 In other words, infection may be severe because of failed disease tolerance (ie, endurance).44–46 There may be differences in disease tolerance among patients with ACLF. Thus, for any given level of systemic inflammation, patients with ACLF who had prior episodes of decompensation of liver disease were less severe than those who did not have prior episodes of decompensation.9 Patients with a prior history of liver decompensation may have acquired an increased tolerance capacity that protected them when exposed to new noxious stimuli. It has recently been shown that patients with ACLF had both marked systemic inflammation (ie, increased plasma cytokines levels) and some features of immune suppression.24 Indeed, these patients had increased frequency of circulating CD14-positive monocytes that overexpressed the protein MER and exhibited a decreased ex vivo response to LPS.24 These results were expected because MER receptors are members of the Tyro3, AXL oncogene, MER (TAM) family receptor-tyrosine kinases, which are known to inhibit TLR4 signalling.47 Another study found that plasma from patients with ACLF had increased levels of prostaglandin E2 (PGE2), which may inhibit macrophage cytokine production in response to LPS.48 In addition, PGE2 was found to decrease the macrophage ability to kill bacteria.48 Together, these findings suggest that, in patients with ACLF, an immune suppression of monocytes/macrophages develops in parallel to the systemic inflammatory response. The suppression of monocyte/macrophage functions would explain the high risk of nosocomial infections in patients with ACLF. It has been suggested that, in patients with ACLF, immune suppression might be a regulation whose purpose is to limit responses of effector monocytes to elevated amount of extracellular stimuli (PAMPs, DAMPs, soluble signals, cytokines, chemokines).27 ,49 However, there is currently no evidence supporting this hypothesis. Future studies should investigate whether the development of excessive systemic inflammation and that of immune suppression are related to each other in patients with ACLF. Among all operational definitions of ACLF (table 1), the definition and diagnostic criteria proposed by the EASL-CLIF Consortium represent the first one based on large prospective data including all patients with cirrhosis, regardless of the presence of infection, from a multicentre European prospective cohort, the CANONIC study. According to this cohort, ACLF is defined as acute decompensation (AD) of cirrhosis associated with OF and high short-term mortality (28-day mortality ≥15%).9 The SOFA score was the model used for the diagnosis of OF, as it is a widely used method in critically ill patients and is superior to Model For End-Stage Liver Disease (MELD) score in predicting prognosis in patients with AD of cirrhosis associated with OFs.9 ,50 Considering that the components of SOFA score (liver, kidney, brain, coagulation, circulation and lungs) do not take into account specific characteristics of patients with cirrhosis, the method used for the diagnosis of ACLF was a modified version of SOFA score, called CLIF-SOFA score. This was later simplified in a new version called CLIF Consortium Organ Failure score (CLIF-C OFs)10 (table 7). The presence and the number of OFs as assessed by the CLIF-SOFA or the CLIF-C OF scores were associated with 28-day and 90-day mortality. Moreover, some specific organ dysfunction such as kidney dysfunction and moderate HE, when associated with single OF, were also associated with prognosis. On this background, diagnostic criteria of ACLF were established according to the presence, type and number of OFs. 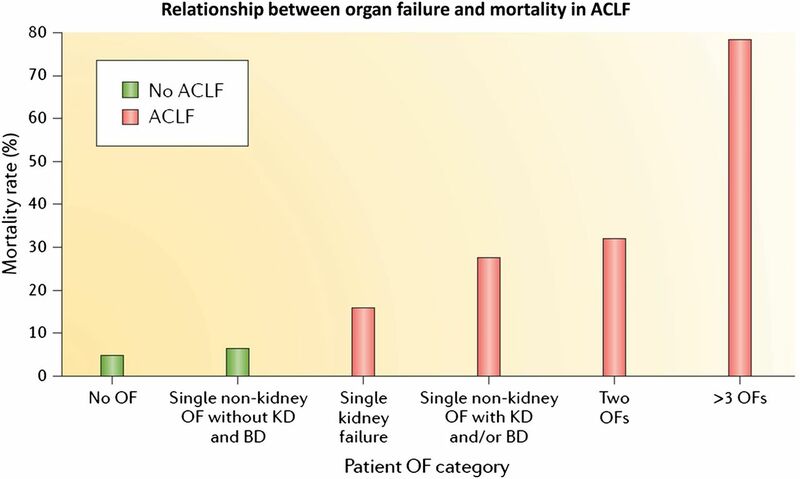 Severity of ACLF was graded into different stages according to the number of OFs on ACLF grade 1, grade 2 and grade 39 (table 1, under EASL-CLIF column) and mortality correlates with ACLF severity (figure 2). It should be noted that ACLF may occur both in patients with previously compensated or decompensated cirrhosis, and also in patients with underlying chronic liver disease without cirrhosis. In this context, the WGO proposed a further classification of ACLF into three groups, according to the underlying liver disease: type A ACLF (patients with underlying non-cirrhotic chronic liver disease), type B ACLF (patients with previous compensated cirrhosis) and type C ACLF (patients with previous decompensated cirrhosis).8 Type A ACLF is that occurring in patients with non-cirrhotic chronic liver disease and it may have a clinical presentation similar to that of acute or subacute liver failure. Considering that acute or reactivation of viral hepatitis is the most common precipitating event in the East,5 type A ACLF would preferentially be more frequent in Eastern countries. Using the CANONIC study as a reference, type A patients with ACLF would need to have at least (1) single kidney failure; (2) single liver, coagulation, circulatory or lung failure that is associated with a serum creatinine level of 1.5–1.9 mg/dL and/or HE grade 1 or grade 2 or (3) single brain failure with a serum creatinine level of 1.5–1.9 mg/dL (table 7). The definition of ACLF type A needs further validation in prospectively collected cohorts to establish whether this patient population indeed has a mortality rate ≥15% after 28 days. Type B or C ACLF are those occurring in patients with underlying cirrhosis. Interesting data from the CANONIC study show that patients with previous decompensation (type C ACLF) had a significantly lower mortality compared with those patients without previous decompensation (type B ACLF).9 The reason for this difference needs further investigation, but it could be related to a decrease in the capacity of tolerance of vital organs to inflammatory response in patients without previous decompensations. As described above, ACLF is associated with high short-term mortality. ACLF grade at diagnosis is associated with short-term prognosis, with patients with ACLF grade 3 showing the worst prognosis compared with that of patients with ACLF grade 1 and 2. Data from the CANONIC study showed overall 28-day mortality of 33% of all cases of ACLF, and specific 28-day mortality rates in patients with ACLF grade 1, 2 and 3 was 22%, 32% and 73%, respectively9 (figure 2). Therefore, it is very important to stratify patients according to prognosis, in order to monitor treatment responsiveness, determine emergency for transplantation, decide allocation in the intensive care unit (ICU) and also to have a rational basis to decide futility. A recent study also based on the CANONIC study population, developed and independently validated a new scoring system with higher prognostic accuracy than conventional measures (MELD, MELD-Na and Child-Pugh-Turcotte scores) and also than CLIF-SOFA score. This is the so-called CLIF-C ACLF score. In order to build this score, CLIF-C OFs was combined with other two baseline variables that were selected as the best predictors of mortality: age and log-transformed white blood cell (WBC) count. CLIF-C ACLF score is calculated by the following equation: CLIF-C ACLFs=10×(0.33×CLIF-C OFs+0.04×age+0.63×ln (WBC count)-–2) and the final score ranges from 0 to 100.10 This score can be easily calculated in the EF-CLIF website: http://www.efclif.com. CLIF-C ACLF score showed a significantly higher predictive accuracy than MELD, MELD-Na and Child-Pugh-Turcotte score at all main time points after ACLF diagnosis (28, 90, 180 and 365 days). 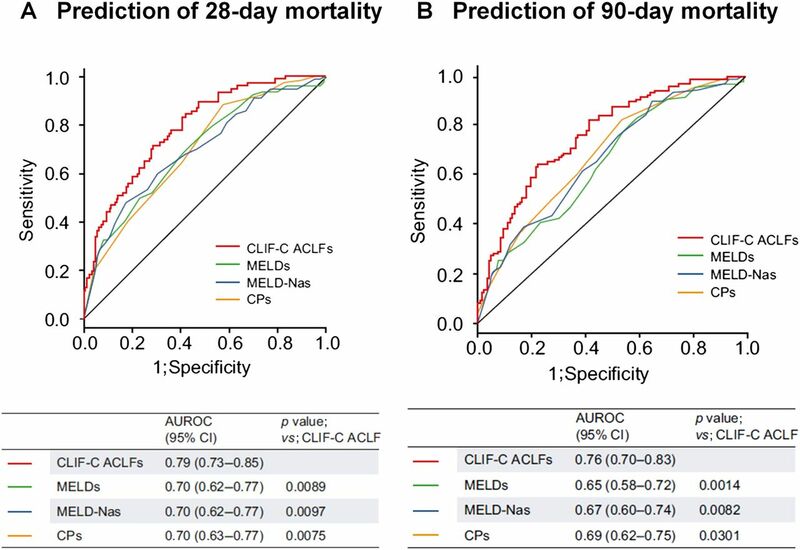 As compared with MELD, MELD-Na and Child-Pugh-Turcotte scores, the area under the receiver operating curve estimated for the CLIF-C ACLF score to predict 28-day and 90-day mortality were significantly higher and indicated a 7%–11% improvement in the discrimination ability10 (figure 3). Considering the newly defined scoring systems and recent data indicating that sequential assessment of prognosis seems to have higher accuracy than prognosis evaluated at the diagnosis of ACLF, stepwise algorithms have been proposed to assess prognosis and help decision making in patients with cirrhosis and ACLF. In summary, it is suggested that when a patient is admitted to hospital with AD of cirrhosis, CLIF-C OF score should be applied. This score will divide patients according to the presence or absence of ACLF. If ACLF is diagnosed, prognosis should be assessed by the CLIF-C ACLF score which should be calculated at the diagnosis of the syndrome and also 3–7 days after admission51 (figure 4). Proposed algorithm for the management of patients with acute-on-chronic liver failure (ACLF) or decompensated cirrhosis. A proposed management strategy for patients with ACLF based on mortality rate data from the CANONIC study.8 The first step is the assessment of ACLF grade at days 3–7 after initiation of medical management, including organ support. Liver transplantation should be assessed in all patients with ACLF because of high 90-day mortality rates (>20%). Liver transplantation should be performed as early as possible in patients with ACLF grade 2 and grade 3 as they are at considerable risk of short-term (28-day) mortality. In the case of contraindication of liver transplantation, the presence of four or more organ failures (OFs) or a Chronic Liver Failure Consortium (CLIF-C) ACLF score of >64 at days 3–7 after diagnosis could indicate the futility of care. ICU, intensive care unit. Adapted from Gustot et al51 and obtained from Arroyo et al27 with permission. Currently, there is no specific effective treatment available for patients with ACLF, and therefore treatment is based on organ support and treatment of associated complications. When ACLF is associated with a precipitating factor (ie, bacterial infections, GI bleeding, alcoholism, drug toxicity), early identification and treatment of the precipitating factor are essential. However, this may not prevent the development or worsening of the syndrome. In addition, in up to 40% of patients a precipitating factor may not be identified. Moreover, available data suggest that although the precipitating factor may be the trigger of ACLF, it may not be an essential predictor of prognosis.9 Overall, patients with ACLF should be considered to be admitted to the ICU and should be preferably managed in a transplant centre. Organ function should be monitored frequently and early treatment provided according to each specific organ in order to avoid a stage of multiple OF. General management should be based on current guidelines and recent reviews on the management of critically ill patients with cirrhosis.52 ,53 Therefore, this review will focus only on specific therapies for ACLF. Data on LT and outcome in patients with ACLF are scarce and interpretation may be difficult due to different ACLF definitions and short series of patients. Data from the CANONIC study are limited as only few patients were transplanted, 9% within 28 days and 15% within 90 days after admission. In patients with ACLF grade 2 or 3, survival without LT was <20%, but increased to 80% in those patients who received LT, results comparable with those patients transplanted without ACLF. In this cohort, the median delay between ACLF diagnosis and LT was 11 (1–28) days.9 Another study that included 238 patients used intention-to-treat analysis and showed a 5-year post-LT survival of >80% for patients eligible for LT.54 However, it should be noted that LT was feasible in <25% of patients' cohort, as many patients could not be transplanted due to age, active alcoholism, active infections or other comorbidities. The timing of transplantation is crucial particularly in patients with ACLF, as these patients may provide a short window of opportunity due to the risk of development of multiorgan failure precluding LT. Considering the good outcomes described so far, it could be suggested to include high-risk patients with ACLF as an indication for high urgency allocation for LT. However, this may be controversial and is still not performed in most countries, but it is an option that could be studied in future studies. Extracorporal liver support systems, particularly albumin dialysis and/or plasma exchange have been proposed as new therapeutic options that could be used as a bridge to LT in patients with ACLF.55–58 These systems are aimed at improving clinical, neurological and biological parameters. These improvements could allow waiting for LT in better conditions. Trials performed to evaluate the usefulness of these liver support systems usually include a heterogeneous population of patients with decompensated cirrhosis associated with different degrees of OF. However, to date there are no studies evaluating these devices using the current definition of ACLF. Overall, heterogeneity of patients and definitions and duration of treatment and modalities makes difficult to evaluate the usefulness of these devices particularly in patients with ACLF. Therefore, further RCT with homogenous definition of the syndrome are needed to re-evaluate the effect of liver support systems on survival. Considering that currently there is no specific treatment for the management of ACLF, research should be based on potential new treatments addressed to pathophysiological mechanisms leading to the development of the syndrome. Large body of evidence from the last decades suggests that bacterial translocation (BT) and an excessive systemic inflammation are the key mechanisms leading to the progression of cirrhosis and the development of ACLF. Therapeutic interventions acting on BT (ie, probiotics, norfloxacin, rifaximin) would probably act in the prevention of the development of ACLF rather than in the management of the syndrome itself once it has developed. In contrast, therapeutic interventions addressed to mitigate the excessive systemic inflammation and to restore the immunological response should be investigated as potential treatment options. On this background, innovative therapies based on immunomodulatory or liver regenerative effects have been proposed as new therapeutic approaches, including administration of granulocyte-colony stimulating factor (G-CSF) and stem cell transplantation. G-CSF therapy in ACLF is only based on two randomised clinical trials. Garg et al11 randomised 47 patients to 5 μg/kg G-CSF subcutaneously (n=23) vs placebo/standard medical care (n=24) and found that the probability of survival at day 60 was 66% vs 26%, respectively (p=0.001). Other parameters such as the Child-Pugh-Turcotte and SOFA scores improved and patients receiving G-CSF were less likely to develop hepatorenal syndrome, HE or sepsis. In another study, Duan et al59 randomised 55 patients with HBV-associated ACLF to G-CSF vs placebo/standard of care. The probability of survival at 90 days was 48% in the G-CSF group compared with 21.4% in the placebo group. Similar to the study by Garg et al, patients on G-CSF achieved reduction in MELD score. Side effects were mild and expected from the use of G-CSF (nausea, vomits, fever, rash). Overall, the use of G-CSF in patients with ACLF is still experimental as it has been used in 102 patients but the results are encouraging. There is only one stem cells trial in humans. Shi et al60 using an open-label controlled trial enrolled 43 hepatitis B patients with ACLF to receive umbilical cord-derived mesenchymal stem cells (UC-MSC, n=24) vs 19 patients with saline as controls. After 90 days, 79.2% on the UC-MSC survived vs 52.5% in the control group. MELD scores also decreased over time (in both groups) but more in the UC-MSC (10 vs 15, p=0.04). Self-limited fever from UC-MSC was reported, but no other significant side effects. Overall, both therapies (G-CSF and stem cells) showed encouraging results, but the optimism is limited by the small number of participants. Nowadays, it is difficult to prevent ACLF unless the clinician is aware of the syndrome and its clinical implications. Initiatives such as this one, cohort studies (CANONIC, NACSELD) and group consensus (APASL, WGO) help in the identification of the syndrome. Borrowing terms from preventive medicine, the current management of ACLF is a tertiary or, at its best, secondary prevention. In other words, once ACLF have occurred, the following days will determine whether the patient will undergo recovery or not with full medical support including evaluation for liver transplant (tertiary prevention). In some occasions, only one organ has failed and the aim is to prevent further OF involvement by providing aggressive medical care (eg, antibiotics to prevent hepatorenal syndrome in the setting of gastrointestinal bleeding (GIB)). Preventing other OFs is an example of secondary prevention (damage is present but aiming to reduce further damage). It is the grail of ACLF treatment, however, to prevent the onset of syndrome (primary prevention). APASL has noted a ‘golden window’, a short period of about 1 week before the onset of sepsis and development of extrahepatic OF in a patient with ACLF.5 Interventions during this period are likely to prevent OF and perhaps the development of ACLF (‘primary prophylaxis’). Currently, other than the thorough identification, history, physical and pertinent laboratory/imaging studies, there are no other means to detect this ‘golden window’. Prevention of ACLF should be based on treatments targeting the key pathophysiological mechanisms leading to disease progression and development of ACLF. Evidence from the last decade suggests that these key mechanisms are mainly the impairment of the gut-liver axis leading to BT and systemic inflammation. Therefore, therapeutic interventions targeting BT and those modulating inflammatory response (ie, norfloxacin, rifaximin, albumin, statins) should be investigated as potential first-line treatments. The authors would like to thank Nicki van Berckel, for her administrative support in putting together this paper.
. Liver failure determines the extra-hepatic organ failure and outcome in patients with acute-on-chronic liver failure: analysis of 1363 patients of AARC Data Base. Hepatology 2014;60:556A. RM and PG are joint senior authors. Contributors RH, PG, ES and RM wrote and contributed to this paper equally. Final review and approval was given by all authors. Funding Some of the work mentioned has been supported by grants awarded to PG (PI12/00330), integrated in the Plan Nacional I+D+I and co-funded by ISCIII-Subdirección General de Evaluación and European Regional Development Fund FEDER; Agencia de Gestió d'Ajuts Universitaris I de Recerca (AGAUR) 2014/SGR 708; PG is a recipient of an ICREA Academia Award. Acknowledgement is made to the LiverHope project, part of the EC H2020-SC1-2016-RTD programme, number: 731875. Competing interests PG declares that he has received research funding from Ferring Pharmaceuticals, Grifols S.A. and Sequana Medical. He has participated on Advisory Boards for Ferring Pharmaceuticals, Promethera and Novartis.